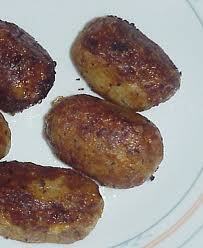 Potatoes – 3 medium. Remove skin, boil and mash. In a mixing bowl, add the cooled mashed potatoes and corned beef from tin and mix well.Add shallots, green chilly, five spice powder and the egg yolk and mix well.Shape the cutlets using your hands. 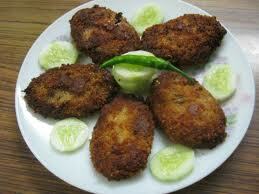 Each cutlet should be about a thumb’s length in diameter and a thumb’s width in thickness. The mixture should yield about 15 cutlets.In a deep non-stick pan, add enough oil to submerge half the thickness of a cutlet and heat oil till hot but not smoking. Coat each cutlet completely with egg white before easing slowly into the frying pan. (Careful not to dunk the cutlets in and get scalded by hot oil!) Reduce heat to medium. Cutlets should continue to sizzle while frying. Fry for 3 mins each side or until nice and golden brown before removing from pan.Dry on paper towels to soak up extra oil before serving.